Originally a funeral mound, constructed either to commemorate a great person or to house his relics, the stupa is the quintessential symbol of the Buddha. 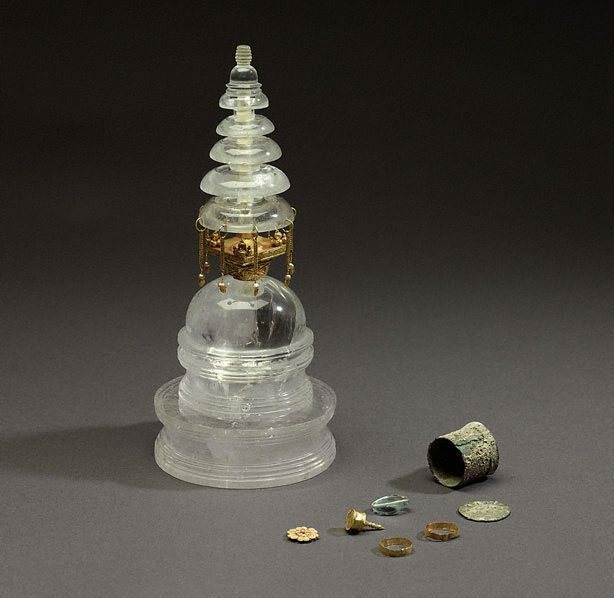 While architectural stupas serve as places of worship, smaller ones are used as reliquaries and votive offerings.The veneration accorded a reliquary stupa is determined by its size, rarity and preciousness of the materials from which it is made, such as gold, rock crystal, or silver. This stupa contains a reliquary containing a small gold stupa inside it. The whole ensemble would have been placed within at least one other case, perhaps of stone, before being placed at the base of an architectural stupa. Asian Art Department, AGNSW, September 2013.